Trying To Be Thoughtful: SWEEP! 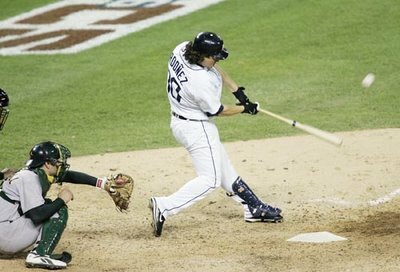 Tigers beat A's 6-3, head for World Series! SWEEP! 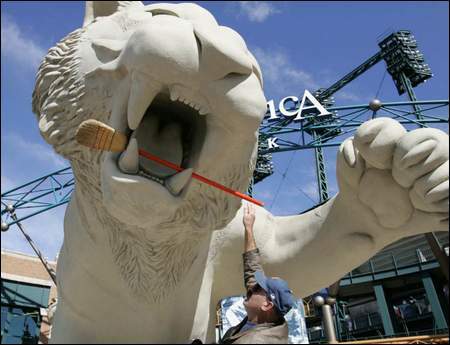 Tigers beat A's 6-3, head for World Series! Due to circumstances beyond my control, I didn't even get to write about the delayed Game 3, and now they've gone and won them all! I'm so happy. Detroit has great fans, who stick by their teams through thick and thin, and this is the best. Detroit and Michigan haven't had the greatest past few years - unemployment from massive auto layoffs, which leads to doldrums in every other sector. Detroit has some great stuff downtown - huge overhaul of the beautiful DIA (still in progress), the two new stadiums, Greektown, the Michigan Opera Theatre, the Fox Theatre ("Historic Fox" and "Fox Theatre's Rebirth" from the Detroit News) and much more - but are mightily hampered by budgetary insufficiencies. This can only help.